Hang 'em High - Oddly Aroused! Confusion abounds as Flannery Quirk protects Sonya Crimson from a trio of deadly assassins chasing them across the Rub Al Khali desert! Just go with it and these random threads of moments will be made into a whole tapestry…eventually. Trust me! In the meantime, we’re having fun! Art-wise, this looks more like Arizona than Arabia despite the name, and I love the horse’s surprised expression! Thank you, paws4thot! I can’t take credit for it. It’s an unabashed swipe from a Conan comic by John Buscema. I had the idea of Quirk cradling the comatose Sonya in his arms while being chased across the desert by assassins and I needed reference for the horse (because they are damn difficult to draw). 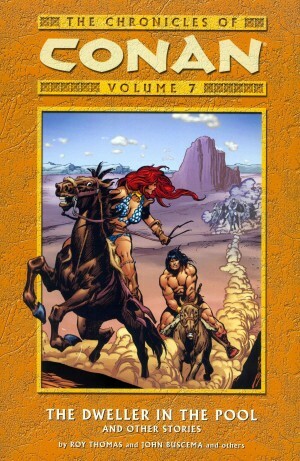 So, I went to my extensive collection of Conan material and there it was, Conan and Red Sonja on horseback being chased through the desert by Kozaki warriors. I tried to put my own swing on it. It worked in context of the story and got the job done…and besides, Buscema draws horses so freakin’ well! Ah, interesting. So the real Sonya is out of the fight for the moment. I like that the abandoned temple(?) from earlier is in the background. Yes, if I hadn’t covered it up with that massive and slightly suggestive title, you could see that without a doubt they are running from the aforementioned, Temple of the Damned. Maybe Quirk is trying to protect both versions of Agnes/Sonya by luring the assassins away from the temple where Agnes currently is.